Do you know the secret of polenta? (Shhhh... It's just good, ole yellow corn grits with a fancified name.) I think someone had to come up with an alias just to get those snooty food people and silly Northerners to even try them. I can't say that I blame them. I'm often afraid to order grits in a restaurant. They're usually bland, white and tasteless. But slowly simmered yellow cornmeal... Now, that's a completely different story! 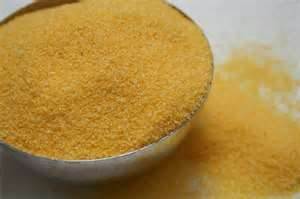 Polenta can be soft or firm and enjoyed anytime of the day or night. It can, just like grits, be cooled and hardened, cut and sauteed or grilled. I've made it lots of different ways, but this recipe is a snap and VERY delicious. The cream creates a velvety texture and the Parmesan and rosemary kick up the flavor. I'd never steer you wrong... just give it a try. 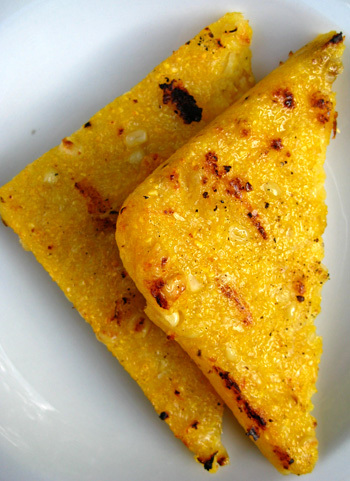 This polenta would be lovely topped with a wild mushroom ragu, oven roasted veggies or a nice piece of grilled fish. Get creative! I served it with my hearty Italian gravy and hand-rolled meatballs. I added steamed veggies and a crusty loaf of bread. A delicious dinner no matter what you call it! In a deep saucepan, bring water, cream and salt to a boil. Reduce heat to low. Add chicken base, garlic and pepper. Stir in polenta and continue to stir for a few minutes, until it is creamy and well blended. Cook on very low heat for approximately thirty minutes, or until the polenta is done. Make sure you stir it frequently so the bottom won't stick. Add the butter, Parmesan cheese and fresh rosemary. Stir and taste for seasonings. Butter a 13x9" glass baking dish and pour hot polenta into dish. Set it aside while you prepare the rest of your dinner. The polenta will retain it's shape, hardening as it cools. Cut into squares. Warm when ready to serve by heating it in a non-stick skillet or grill pan that has been treated with cooking spray or oil. Pour your favorite sauce over and serve.